The big question has been asked and answered; the ring is perfectly positioned on your finger and the planning has begun. Pinterest, bridal magazines, and runway shows have become a part of your daily existence, and now details of flowers, cakes, and shoes have invaded your dreams. Since flirty printed bridesmaid dresses are the hot trend for spring and summer in 2015, dress choices seem to be a bit easier, but what is the best way to incorporate this trend into your big day? How can you blend this trend with your personal style to make your party really unique? Here are 4 fun, fashionable ways to ensure that this hot trend in bridesmaid dresses creates an impression on your wedding day! #1: Play on a mix of print and colors. Choose your favorite print and then ask each bridesmaid to choose a different, coordinating color. Standing together, the print will clearly unify the party in complementing colors, perhaps even mimicking the flowers in your bouquet. For a spring or summer outdoor garden wedding, consider a fresh floral print in a combination of colors to mirror the natural beauty of the venue. #2: Same print, coordinating styles. If you are looking for a bridal fashion favorite, choose the print and then allow the bridesmaids to choose the style of dress that looks best on them. This season’s dress trends offer a variety of necklines and stylish cuts, from sweethearts and halters to empire waists and A-line skirts, which complement a variety of body shapes and blend a wide range of fashion sensibilities. For a fun, youthful twist on your wedding party, look for more casual bridesmaid dresses to pair with lightweight sports jackets for the groomsmen. #3: Draw eyes to the legs. For a twist on the coordinating dress styles idea, choose printed bridesmaid dresses that focus the print, and thus all eyes, on the hemline and vary the hemlines for each bridesmaid. The look is dramatic ranging from sassy short bridesmaid dresses to elegant floor length gowns depending on the number of bridesmaids and your personal style. #4: Mix it up with prints and solids. Another version is to mix a print with a solid coordinating color. For example, choose a bridesmaid dress from the Allure Bridesmaid In Bloom printed dress collection with its spring-fresh florals and pair it with the same style of dress in a single color matching or complementing the print. This mix of the print and solid color is unique to you and your day. However you decide to personalize your wedding, printed bridesmaid dresses are one of the hottest trends for the spring of 2015. Be inspired by the latest runway fashions; combine them with casual and fun cuts, and then enjoy the big day! 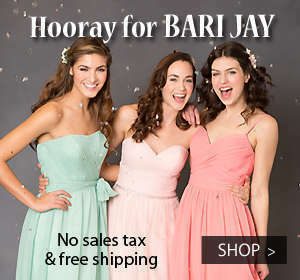 Shop our Online Bridesmaid Dress Collections at House of Brides! 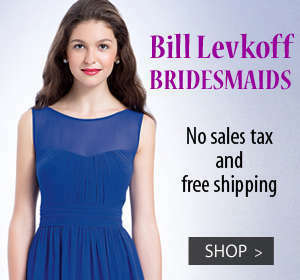 Previous Article← Black Friday Bridal Sale at House of Brides!